The curb strap is used in both English and western horse back riding. It is an added accessory that may or may not be necessary depending on your horse's level of training and the type of bit you are using. Improper use of a curb strap can cause your horse discomfort and make your commands difficult to understand so it is important that you make sure to use the curb strap properly. The curb strap is a simple piece of equipment. It is a flat strip of leather or nylon with buckles on either end that will form loops when fastened. The curb strap is looped through the loops on both sides of your horse's bit and fastened back in order to stay in place. Curb straps can vary in width but are never more than an inch wide. Curb straps are not typically sold with the bridle and in most cases you will have to purchase one separately. They normally cost between $3 and $10. The curb strap is attached to the bit on your bridle. There are hundreds of different variations of bit and even the same general type of bit may be designed differently by different manufacturers. Remember that the curb chain is designed to go underneath your horse's chin when the bit is in his mouth. Curb and shanked bits, which are designed to be used specifically with a curb strap or chain, almost always feature a separate area on the bit behind the loop. Non-curb bits may or may not have a separate area for an optional curb. In those cases, it is normal to attach the curb in the same location where the bridle is attached, just below the cheek pieces. 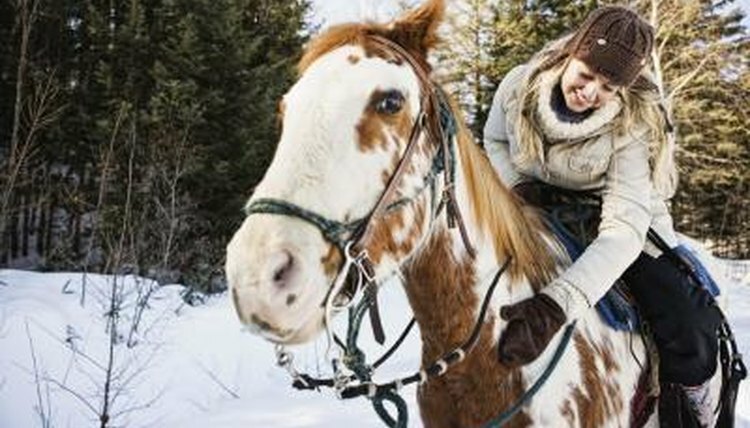 Remember that the curb strap should never interfere with the action of the reins or be left loose to slide around on the bits. Loose ring snaffles and similar bits are not meant to be used with a curb strap. The action of the curb sliding around on your bit will not benefit your horse. Curb straps are used to increase pressure and help create leverage with shanked bits. When you attach your curb strap you need to make sure you can easily get at least three fingers between your horse's skin and the strap. The buckles on the curb should face outwards with the metal away from your horse's skin and the flat part of the curb facing towards him. The strap should not be too tight but a strap that is too loose will not be able to function properly. Some people use a loose curb strap simply to prevent the bit from being pulled through the horse's mouth. A curb strap will not make a poorly trained horse behave and is not a substitution for proper training. A curb chain is sometimes confused with a curb strap and serves the same general purpose and function. The curb chain is a piece of metal chain with loops. The curb chain is generally considered to be a harsher tool than the curb strap but the two are used the same way. If you use a curb chain, twist the chain so that the metal lies flat before you attach it to your bit.